Scott Slight ski review / Fritschi Tecton 12 binding review. If you’re searching for the holy grail in a pair of skis, you could get pretty close with a pair of Scott Slights. The Slights come in 93 underfoot, and 100 underfoot versions, with corresponding lengths of 160/165/170/175/180 (in the 93s), and 168/178/188 (in the 100s) . The 93s won the Fall Line Magazine ‘Ski of the Year’ award this year, so come highly praised. I’ve been skiing on a pair of Slight 100s in a 178 length this season, and am really enjoying them. Back in the day, I had a pair of Scott Missions, which was a fantastic all terrain ski that has been hard to replace, and following on from the excellent Ventures, the new Slight has filled the gap and improved on both of those skis. It’s a fantastic ski, and despite the ‘slightly’ (sorry) hefty price tag, is really worth it because with them you may find you’ll only need one pair of skis in your life . It’s pretty light for a freeride ski, which makes it work for touring use, as the weight penalty is minimal. (1700g per ski for a 178cm). The 100mm underfoot feels very stable off piste, and the wide tips allow plenty of float in deep snow. 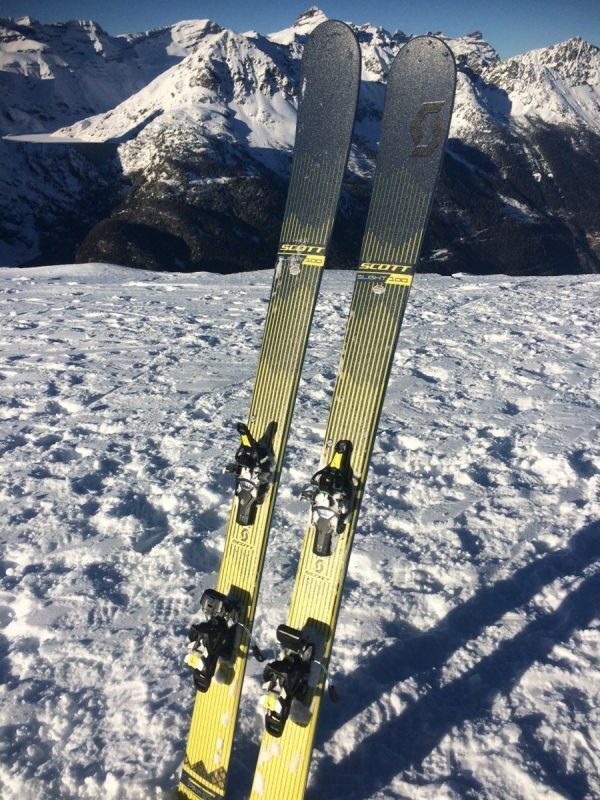 The 18m turn radius (on the 178s) means that the skis come around easily and feel responsive in tight terrain. The 93 has a turn radius ranging from 13m to 17m across the sizes. (The 100’s turn radius ranges from 16-20m). They carve well on the piste and feel rock solid at speed, with no chatter at all, so they really are suitable for anything you can throw at them. I’ve combined the Slights with a pair of the new Frischi Tecton 12 bindings. The Tecton is pretty close to perfection, as it’s a light binding that gives downhill security thanks to the sideways release of the toe-pins. The Tecton looks like a downhill binding, but with a pin-style toe piece, a little like the Marker Kingpin, but lighter, at 630g including brakes. They are easy to use, with a step in heel mechanism like a downhill binding, and a toe-stopper at the front, making the boot easy and quick to locate in the pins, even in deep snow. The heel risers for climbing are simple fold over steps, easily managed with the end of a ski pole. The combination of the toe piece with lateral release mechanism, and front and back DIN settings means that this binding offers the same level of safety as an alpine binding. Could this be it? The perfect all-round set-up? ?